Shockingly enough, H-E Double Hockey Sticks still aired on the Disney Channel back in the early 2000s. I guess it makes sense if you consider the source material. But a film that partially takes place in hell? Very odd choice. But I guess it’s less surprising when you realize how badly it wants to be a kids’ movie. Most of the references and puns will definitely go over children’s heads, yet it’s constantly talking down to them anyway–sticking itself in an awkward position of being a film for neither adults nor kids. You could say it’s their way of trying to appeal to both. But for adults to enjoy it more, it can’t compromise its dialogue. Will Friedle plays Griffelkin, the devil’s apprentice. He’s sent to Earth to sway professional hockey player, Dave Heinrich (Matthew Lawrence), to sign over his soul in exchange for his team winning the Stanley Cup. The plot is mostly stretched thin–even for its short runtime–but it picks up once its main objective is reached nearing the 3rd act. But then the film ends abruptly without the entire theme ever becoming fully realized for the audience. The first two acts coast along on Friedle’s talents and improvisations, relying on him too much to carry the film. It allows him almost too much freedom, preventing the movie from taking itself seriously enough. It’s almost too goofy for its dark premise. But then again, if that’s the case, it should be funnier. Friedle is at his best when playing off of Lawrence’s straight-man–much like their dynamic on Boy Meets World. Fans of the TV show will undoubtedly enjoy seeing the actors together again–especially if they’ve never seen this film before. Because watching it a 2nd time may be a chore no matter how much you like them. The film is far from perfect. Though the acting is passable, the script is marginal at best. It’s not too porous, but the holes that do exist are distracting. Plot holes don’t always make or break film. Many times they go unnoticed in a truly entertaining one. The worst kinds of holes are the ones that are so distracting that they prevent you from enjoying the rest of the story. Griffelkin has this device called a flip fork (pun on flip phone), which is a magical tool that can make anything do what he wants it to do. He has supernatural powers that assist him in obtaining his goal. Yet, he spends about 15 minutes towards the beginning trying to find Dave and getting into the same room as him. Are we just supposed to accept this frustrating inconsistency? It is a kids movie after all–but then again, not really, because it takes place in hell and has jokes about flipping people off. The ending isn’t quite as dark, but the lessons learned don’t really come to light, and we’re stuck remembering this as a film about a guy selling his soul to the devil–not about a devil’s apprentice finally seeing the light. It’s an odd movie. At its best, it’s original–considering the context. Although it’s still entertaining enough to watch, and may evoke enough nostalgia that it doesn’t matter. If you want to witness James Van Der Beek attempt to don a Texan accent for 106 minutes, you may not get another chance. While fun, it has all the signs of a stereotypical late-’90s teen movie. It’s cheesy, telegraphed, cliched, crude–yet meaningful. It follows a successful high school football team coached by Bud Kilmer (Jon Voight)–a man who basically runs the community. The small Texas town has already erected a bronze statue made in his likeness. The guy even controls the police to the point that his players can get away with stealing cop cars. That’s how obsessed this community is with their high school football. It’s all they have. Mox (Van Der Beek) doesn’t see it that way. He’s the 2nd string quarterback and has plans to go to Brown University and put the sport behind him. But as soon as he’s forced into the starting role, he enjoys soaking up all the attention. Varsity Blues doesn’t take too many risks–if any–but it has a lot to say. The script is deceptively good. It may be platitudinous in its dialogue and outcomes, but under the surface it makes some seldom-touched upon points. The football scenes are some of the more realistic we’ve seen in movies up to this point, and it organically showcases the importance of football in some small towns in this country. It then proceeds to question that very importance, along with the aggrandizing of athletics in our schools altogether. Subtly juxtaposing these ideals, we see Mox’s little brother, who has an obsession with religions and practices a variety of them throughout the movie, much to his parent’s disapproval. It isn’t perfect, but Varsity Blues holds up well. Voight gives us a compelling villain to despise and the film more nuanced that meets the eye. It made me nostalgic and I was entertained. We all know Matt Damon can act. But if someone were to disagree, you’d have to show them this film. His, along with every single performance in The Talented Mr. Ripley, is top notch. Everything he does is so subtle, yet so calculated, that you believe it all. Or you’re not sure what to believe. You see the brood amidst the confidence. Here, he plays Tom Ripley, a brilliant sociopath who uses his deception skills to fake his wealth. But the thing is, we the audience see every move he makes. It’s the other characters who are being tricked. In fact, Damon is so convincing that it’s not until after the film is over when you realize there’s nothing to like about his character at all. Beautifully shot with authentic set design, The Talented Mr. Ripley leads us in the direction of a truly Hitchcockian feature in every way–the experimentation of narrative, the pseudo-protagonist, and even the signature blonde. You have to applaud this film for keeping the audience on their toes. The story is constantly changing. Resetting its goals. Much like when our brains shift a bit when Janet Leigh dies half way through Psycho. We feel like it should end there. Wouldn’t most movies? Leaving us sitting up in our chairs, it becomes reminiscent of The Master of Suspense, himself. But then, all of a sudden, things change, and it no longer seems that way at all. You realize it keeps avoiding some sort of conclusion. Dancing around it, actually. And usually when films continue on like this, you expect a redeeming ending. However, without giving anything away, we don’t get one. When the movie is constantly showing us its hand, we are left wondering why. Maybe something bigger and better is around the corner. Maybe they’re saving the real twist for the very end. The story has so many chances to give us something grand, but they all fall by the wayside. Director, Anthony Minghella, definitely has the creepy and suspenseful tone down. And he pulls the best performances from his actors. He does a very good job, given the source material. But his the biggest impression he’s left here may be how he gets us to look at Damon in a much different way. I’ve detailed in previous posts my feelings about the current state of children’s television. And while the Disney Channel is the main culprit, I do long for 1999 again when Disney Channel Original Movies (DCOMs) were at their peak. Sure, they were cheesy and full of head-scratching character decisions, but we loved them anyway because the protagonists were just like us. Don’t Look Under the Bed follows Frances (Erin Chambers), a teenage girl living in a small town where, one day, strange things start happening. Dogs are on the roof, the high school’s pool is filled with gelatin, and the letter “B” is spray painted all over town. Everyone is convinced that it’s Frances who’s pulling these pranks, but she befriends Larry Houdini (Ty Hodges)–an imaginary person who only she can see–who informs her that the Boogeyman is framing her. So she tries to figure out why he seems to have a bone to pick with her. The film is full of twists and has some fun scenes that actually hold up fairly well considering the age of the movie and the target demographic. 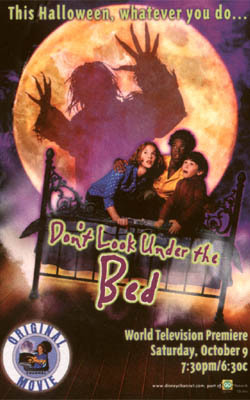 Not that it’s not without a little schmaltz, but believe it or not, compared to its counterparts, Don’t Look Under the Bed isn’t terribly cloying at all–possibly due to the fact that it’s directed by Kenneth Johnson–the creator of The Bionic Woman and The Incredible Hulk TV series. Whatever the reason, if you saw this movie as a child, chances are it stuck with you. It’s Disney Channel’s only PG-rated DCOM–and for a good reason. The scenes with the Boogeyman are seriously creepy. They still haunt me to this day. However, they never make the film lose its youthful essence. Rather, it may be more appealing since it fails to insult its young audience. There’s a good enough balance between the macabre and the jovial to maintain its fun nature. The issues it deals with may not be the deepest, but it’s no Dude, Where’s My Car either. The themes include deep-rooted denial and growing up too fast. It gets its point across without feeling overly preachy. And even older audiences will find the intrinsic emotions relatable and may cause them to conjure up fond memories of their own childhood–much in a Toy Story type of way. In the last 15 minutes, the characters venture into Boogeyland, which is a real highlight to this movie. The world that the filmmakers create is so spooky and detailed that we feel like we’re there too. We wait throughout the whole story to find out where the Boogeyman goes when he’s not creating chaos, and the answer definitely lives up to our expectations. The film’s biggest pitfall is its lead actress. She’s alright when she’s just conversing with other characters, but as soon as she shows any kind of grand emotion, her conviction is nowhere to be found. But the plot holes are scarce and mostly towards the beginning, so we grant it forgiveness during its final act–which may the single greatest ending to any DCOM. In Don’t Look Under the Bed the characters have a lot to lose, and while so many others of its kind take the easy way out, this one really works for it. Looking back on this movie, it holds up really well. It may have been deemed mediocre in 1999, but in 2014 it’s better than many similar films we get nowadays. It narrates itself well through a plot which is, in fact, quite intricate and could have been complicated if executed incorrectly. Fortunately, it moves briskly along the plot points and never leaves us confused or anxious. The only criticism I have with this film is the speed at which Sebastian and Annette fall in love with each other. It’s almost too quick to be believable. It’s not obvious, but for the over analyzer, like myself, it seems odd. Nonetheless, you can’t get mad at this movie because of its alacrity–otherwise it would have been likely to be weighed down by unnecessary scenes. The ending was a little too “big” for the tone of the film, but I didn’t hate it. You want to see Kathryn get what’s coming to her, and she does. However, it would have been more effective and believable if it turned out that Sebastian was really alive in the end, driving away with Annette. The acting is impressive and it’s fun to look at. Cruel Intentions lives up to its name in the best way possible. It’s Halloween time, so I’ve decided to watch some Halloween films of the non-scary variety. Idle Hands may not be a terrible movie, but it’s also not all that memorable. There doesn’t seem like too much of a purpose to it all. Reminiscent of the Evil Dead films, this film subtly sprinkles comedy over the horror, but still doesn’t invoke many laughs. But as nostalgia, we can look back and somewhat appreciate this film for what it is. It serves as a nice addition to the cult halloween movie genre. It’s seldom laugh-out-loud, and it’s also not terribly quotable. However, the cast is fun to watch and it’s far from boring. Idle Hands is so goofy that it just works. Taking pages out of John Hughes’ playbook, 10 Things I Hate About You falls just short of cliche as we forget that much of what made Hughes’ work so clever was that it invented its own cliches–as this film does. While it does subject to the usual idiot adults and predictable plot, there is a lot more depth here than the average teen comedy. Although the chemistry between the leads and their respective partners is impressive, I did ask a little bit more from director Gil Junger. While I know he is more familiar with the world of television, I still expected him to pay a little bit more attention to minute details–which resulted in a bit of sloppiness from time to time. The script has its ups and downs comedically, but as a whole this is a fun and enjoyable movie. It doesn’t rely on one-liners to carry the weight of its humor and it doesn’t waste time with subplots. But although the laughs slow down at times, there aren’t really any eye-rolling jokes. And wisely, there are hints of self-satire carefully scattered throughout. With a killer soundtrack and clever bits, you tend to forget that the premise isn’t groundbreaking. You have to judge a movie based off of its rewatchability, and this one is definitely one that I would watch again.